WaPo Reporter Wins Pulitzer Prize For Exposing Trump's Charity Scams And Breaking #Pussygate Story - Joe.My.God. 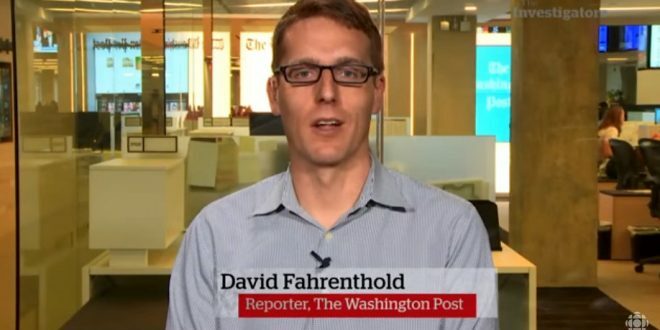 Washington Post reporter David Fahrenthold remembers being struck by Donald Trump’s pledge to donate $6 million, including $1 million of his personal funds, to veteran groups during a televised fundraiser before the Iowa caucuses early last year. Did Trump follow through, he wondered? So, weeks after the event, Fahrenthold started asking questions. For several months, he found, the answer was no, despite assurances to the contrary from Trump’s campaign. When Trump finally made the donation in late May the reporter set off on a broader inquiry. In a detailed series of articles, he found that many of Trump’s philanthropic claims over the years had been exaggerated, and often weren’t truly charitable activities at all.